It has been a longgggggggg time since I have pulled diapers from the dryer in my house. A long time. And I sure as shootin' didn't iron them before they graced a precious bottom. As a matter a fact, that last precious bottom just sped out of the driveway on her way to meet a fella and attend the Blue's game. How far we have come. Again I digress. I know its a trend. 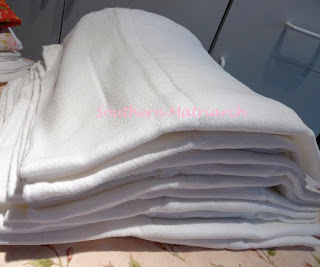 Back to this stack of washed, dried and IRONED diapers. I want to be considered "with it" just like everyone else, so I need to learn how to use my embroidery machine. 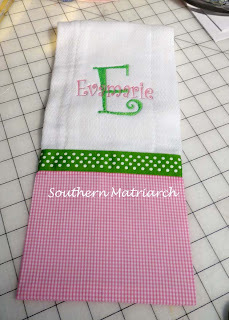 My goal is to make some of those burp cloths that are so popular. I tell you, I can take a skein of floss, a hand needle and make them stand up and bark for dinner; but that embroidery machine makes my hands sweat. Not to be outdone, I will prevail! With a little help my friends. Barb, one of my stitching sisters, digitized the monogram for me. Bless her heart. I then searched on the interwebz for far too long (I bet you could Google "brain surgery" and find a tutorial) to find dozens of tutorials on burp cloths and a new passion was born. Here are the results. I know this doesn't look like much; but I could have traced out an embroidery design for a christening gown in the time it took to accomplish this! Now my mind is a whirling with all of the possibilities. Don't forget the PINK giveaway is open until midnight tonight. Winner to be revealed tomorrow. Pink and green -- I should have known! It looks wonderful. You and Barb make a great team! I guess it all depends on what you get used to doing. I love making burp cloths. I do a lot of them for baby gifts. Yours looks great, and the colors are perfect. Very cute burp cloth, Martha! Looks like you've mastered your embroidery machine to me! Nice job, Martha! By the way, which machine do you have? haha...welcome to the club! It's addictive! You did a great job, too! Very cute, Martha. I the color choices. I think the name is perfect, I'm sure you do as well. So proud of you. I am just the opposite!! I can wip out those embroidered designs projects in no time, but scared to take up needle & thread to make the gorgeous stitched things that you inspire us to do. Good JOB!! Keep at it the ME becomes easier!!! Want to trade???? I will do your ME & you do my bishop smocking??? We got a deal???? That's a great burp cloth. I love the pink and green. That is so cute. I've never used the embroidery side of my machine...now I'm inspired! What stablizing method did you use? Wow! What kind of machines do you have? I am hoping to buy another this year. Martha, You must be my "soul sister", when it comes to the machine embroidery. I wait until my daughter is over and let her walk me through the steps or just take over and do it! How sweet is that... I knew you could do it. Now to do the other 11. Martha, you crack me up! It's funny because your hand embroidery is always just so inspiring! I don't have my embroidery machine yet but I'm sure I will feel the same as you when I finally stitch out that first thing! I'm sure you'll be a master at this very soon and giving us more pretties to look at! Looks like everyone wants to know your machine. That is why I am here too! I have one and wonder if mine can do the same. I keep it pretty simple right now but would love to do something like that!